The Brothers Grimm wrote Little Snow-White, an original German fairytale published in their collection, "Kinder- und Hausmärchen," translated as Children's and Household Tales (1812). Note: for younger children, we recommend this version instead: Snow White, one of our Favorite Fairy Tales. "Looking-glass, Looking-glass, on the wall, Who in this land is the fairest of all?" Then the first looked round and saw that there was a little hole on his bed, and he said, "Who has been getting into my bed?" The others came up and each called out, "Somebody has been lying in my bed too." But the seventh when he looked at his bed saw little Snow-white, who was lying asleep therein. And he called the others, who came running up, and they cried out with astonishment, and brought their seven little candles and let the light fall on little Snow-white. "Oh, heavens! oh, heavens!" cried they, "what a lovely child!" and they were so glad that they did not wake her up, but let her sleep on in the bed. And the seventh dwarf slept with his companions, one hour with each, and so got through the night. When it was morning little Snow-white awoke, and was frightened when she saw the seven dwarfs. But they were friendly and asked her what her name was. "My name is Snow-white," she answered. "How have you come to our house?" said the dwarfs. Then she told them that her step-mother had wished to have her killed, but that the huntsman had spared her life, and that she had run for the whole day, until at last she had found their dwelling. The dwarfs said, "If you will take care of our house, cook, make the beds, wash, sew, and knit, and if you will keep everything neat and clean, you can stay with us and you shall want for nothing." "Yes," said Snow-white, "with all my heart," and she stayed with them. She kept the house in order for them; in the mornings they went to the mountains and looked for copper and gold, in the evenings they came back, and then their supper had to be ready. The girl was alone the whole day, so the good dwarfs warned her and said, "Beware of your step-mother, she will soon know that you are here; be sure to let no one come in." And so she thought and thought again how she might kill her, for so long as she was not the fairest in the whole land, envy let her have no rest. And when she had at last thought of something to do, she painted her face, and dressed herself like an old pedler-woman, and no one could have known her. In this disguise she went over the seven mountains to the seven dwarfs, and knocked at the door and cried, "Pretty things to sell, very cheap, very cheap." Little Snow-white looked out of the window and called out, "Good-day my good woman, what have you to sell?" "Good things, pretty things," she answered; "stay-laces of all colours," and she pulled out one which was woven of bright-coloured silk. "I may let the worthy old woman in," thought Snow-white, and she unbolted the door and bought the pretty laces. "Child," said the old woman, "what a fright you look; come, I will lace you properly for once." Snow-white had no suspicion, but stood before her, and let herself be laced with the new laces. But the old woman laced so quickly and so tightly that Snow-white lost her breath and fell down as if dead. "Now I am the most beautiful," said the Queen to herself, and ran away. 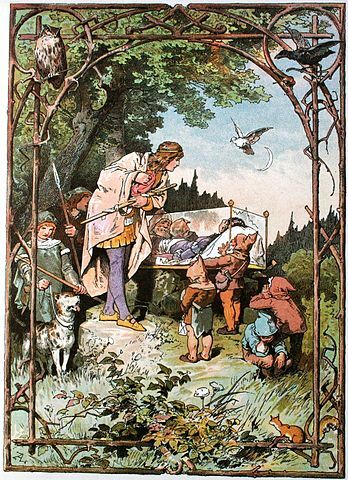 Not long afterwards, in the evening, the seven dwarfs came home, but how shocked they were when they saw their dear little Snow-white lying on the ground, and that she neither stirred nor moved, and seemed to be dead. They lifted her up, and, as they saw that she was laced too tightly, they cut the laces; then she began to breathe a little, and after a while came to life again. When the dwarfs heard what had happened they said, "The old pedler-woman was no one else than the wicked Queen; take care and let no one come in when we are not with you." When she heard that, all her blood rushed to her heart with fear, for she saw plainly that little Snow-white was again alive. "But now," she said, "I will think of something that shall put an end to you," and by the help of witchcraft, which she understood, she made a poisonous comb. Then she disguised herself and took the shape of another old woman. So she went over the seven mountains to the seven dwarfs, knocked at the door, and cried, "Good things to sell, cheap, cheap!" Little Snow-white looked out and said, "Go away; I cannot let any one come in." "I suppose you can look," said the old woman, and pulled the poisonous comb out and held it up. It pleased the girl so well that she let herself be beguiled, and opened the door. When they had made a bargain the old woman said, "Now I will comb you properly for once." Poor little Snow-white had no suspicion, and let the old woman do as she pleased, but hardly had she put the comb in her hair than the poison in it took effect, and the girl fell down senseless. "You paragon of beauty," said the wicked woman, "you are done for now," and she went away. "Snow-white shall die," she cried, "even if it costs me my life!" When the apple was ready she painted her face, and dressed herself up as a country-woman, and so she went over the seven mountains to the seven dwarfs. She knocked at the door. Snow-white put her head out of the window and said, "I cannot let any one in; the seven dwarfs have forbidden me." "It is all the same to me," answered the woman, "I shall soon get rid of my apples. There, I will give you one." "No," said Snow-white, "I dare not take anything." "Are you afraid of poison?" said the old woman; "look, I will cut the apple in two pieces; you eat the red cheek, and I will eat the white." The apple was so cunningly made that only the red cheek was poisoned. Snow-white longed for the fine apple, and when she saw that the woman ate part of it she could resist no longer, and stretched out her hand and took the poisonous half. But hardly had she a bit of it in her mouth than she fell down dead. Then the Queen looked at her with a dreadful look, and laughed aloud and said, "White as snow, red as blood, black as ebony-wood! this time the dwarfs cannot wake you up again." Then they were going to bury her, but she still looked as if she were living, and still had her pretty red cheeks. They said, "We could not bury her in the dark ground," and they had a transparent coffin of glass made, so that she could be seen from all sides, and they laid her in it, and wrote her name upon it in golden letters, and that she was a king's daughter. Then they put the coffin out upon the mountain, and one of them always stayed by it and watched it. And birds came too, and wept for Snow-white; first an owl, then a raven, and last a dove. It happened, however, that a king's son came into the forest, and went to the dwarfs' house to spend the night. He saw the coffin on the mountain, and the beautiful Snow-white within it, and read what was written upon it in golden letters. Then he said to the dwarfs, "Let me have the coffin, I will give you whatever you want for it." But the dwarfs answered, "We will not part with it for all the gold in the world." Then he said, "Let me have it as a gift, for I cannot live without seeing Snow-white. I will honour and prize her as my dearest possession." As he spoke in this way the good dwarfs took pity upon him, and gave him the coffin. And now the King's son had it carried away by his servants on their shoulders. And it happened that they stumbled over a tree-stump, and with the shock the poisonous piece of apple which Snow-white had bitten off came out of her throat. And before long she opened her eyes, lifted up the lid of the coffin, sat up, and was once more alive. "Oh, heavens, where am I?" she cried. The King's son, full of joy, said, "You are with me," and told her what had happened, and said, "I love you more than everything in the world; come with me to my father's palace, you shall be my wife." Add Little Snow-White to your own personal library.